After Rob Butcher's tenure as the Executive Director of U.S. Masters Swimming ended, the organization conducted a national recruiting search and landed Newport Beach (California) native, Dawson Hughes. 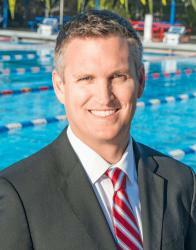 Dawson grew up around the Pacific Ocean and began swimming year-round at the age of 8. He culminated his competitive pool swimming career at the University of Michigan and then began a successful career in sports administration. After directing ticketing programs with the San Diego Padres and Kansas City Royals of Major League Baseball, he moved to the Orange Bowl Committee where he served as vice president of business development where he was responsible for revenue, corporate and community partnerships, and operations management for pro and collegiate sporting events. But with his roots close to the famous Wedge and the shores of the Pacific, he will also oversee the continued development of the masters open water swimming community and the growing 65,000 active members of U.S. Masters Swimming.